I tried, I really did, I just couldn’t finish this book, The Thinking Woman’s Guide to Real Magic by Emily Croy Barker should have been among my all time favorites it has all the components that I absolutely adore in fiction. An intelligent woman, alternate realities, creatures and magic, on the surface it is reminiscent of A Discovery of Witches a brilliantly executed story of another well educated woman and her immersion into a world rife with love and intrigue. 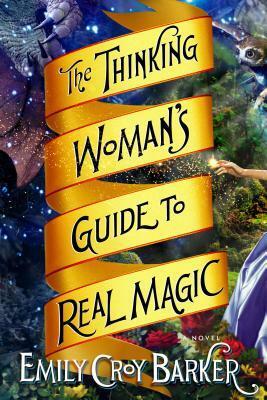 Honestly, it’s hard to articulate what specifically The Thinking Woman’s Guide to Real Magic was missing for me. Personally, I found that Nora was just not a dynamic character and as such had difficulty engaging with her and ultimately caring about her welfare. I was intrigued by Aruendiel, which is probably why I stuck it out until page 297 when I put it down a month ago and just couldn’t bring myself to try again especially when I had so many other books waiting patiently for my attention. I was very disappointed in The Thinking Woman’s Guide to Real Magic particularly when I felt I should have liked it. Note: I won this book for free through Goodreads First Reads and I would like to thank them and the publisher for giving me the opportunity to read and review this book.